The 82 feet / 25 meter Steel Vessel Astrea was built in 1998 and refurbished from 2010 to 2012. 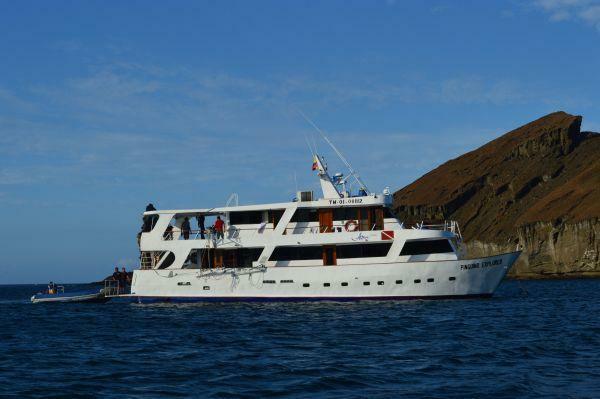 Astrea offers Dive expeditions and seightseeing cruises around the Galapagos archipel. Regular dive trip duration takes from Tuesday to Tuesday and includes up to 19 dives, 2 land visits and 3 diving days around the top spots Wolf and Darwin. 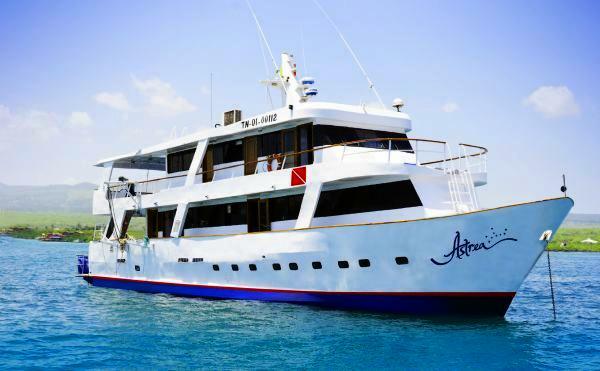 Furthermore Astrea is offering non diving naturalist cruises of the same duration. 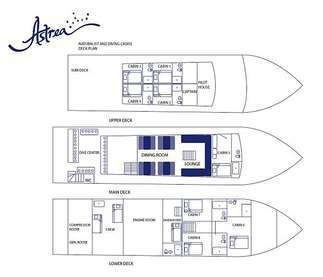 7 twin and 1 double cabin, each with privat bathroom offer space for 16 divers. 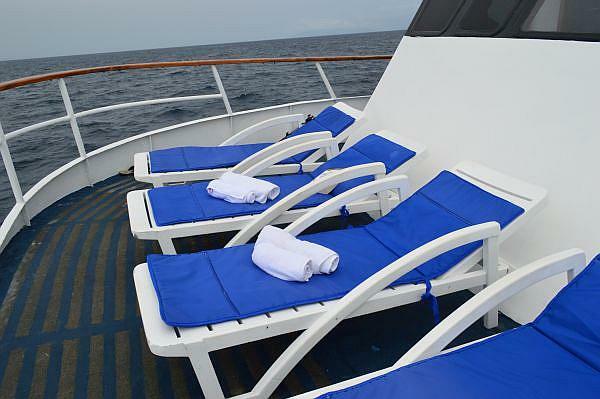 The boat features a lounge on the main deck with air conditioning, TV, audio and video player, library, movies, games, restaurant, terrace bar and relax with solarium and a sundeck with cushioned loungers. Guests can enjoy a variety of international and Ecuadorian cuisine. 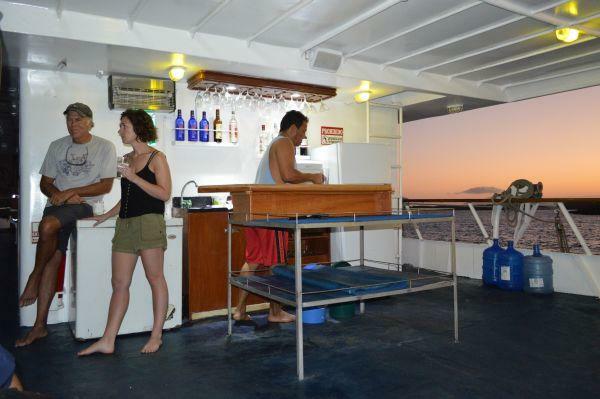 There is a choice of beer, wine, tea, coffee, water and soft drinks available on board. 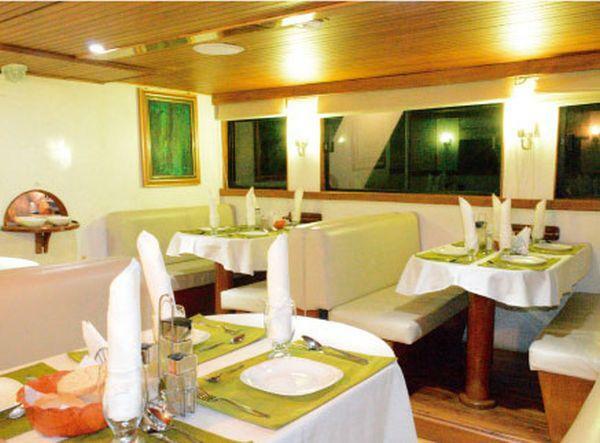 Meals are served at the air-conditioned restaurant, menu and buffet style using the freshest ingredients available. Snacks after the return of each dive/excursion. 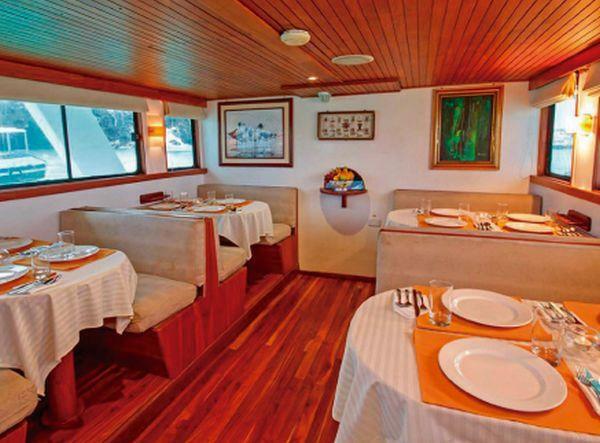 Astrea offers space for 16 divers in 8 cabins located on the lower-, mid-, and upper deck. 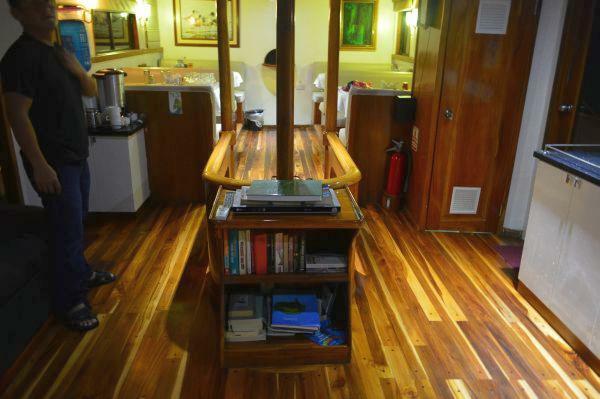 The 4 lower deck cabins have bunk beds, port holes and central A/C, the main deck Master cabin double bed, windows and individually adjustable A/C and TV/DVD. The 3 upper deck cabins bunk beds, windows and individually adjustable A/C. All cabins include private bathroom, how water shower, air conditioning, toiletries, 110 Volt sockets, reading lights, closets, life jackets, fire extinguishers and smoke detectors. The itineraries are subject to changes without prior notice. 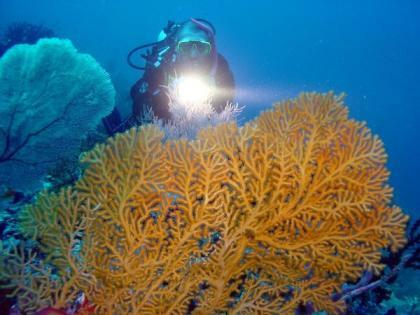 During the dive trip the crew may change itineraries and dives according to local conditions or park regulations. Morning arrival at Baltra airport. Crew Pick up and transfer to Astrea. Boat check in. Afternoon after lunch sailing to Northeast Baltra island and Check out dive. Morning 1 dive in Bartolome, afternoon 2 dives at Cousin and following departure to the northern islands. 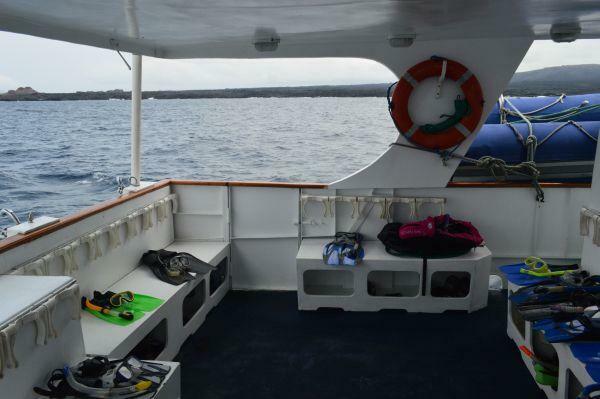 In this remote spot of the Galapagos two dives will take place, one in the Landslide and one in The Cave. Up to 4 dives at Darwins Arch.At this marvelous most northwest island we enjoy 4 dives today at the spot called The Arch. Back at Wolf for two dives at El Derrumbe and La Cueva. Morning 1 dive at Punta Vicente Roca. 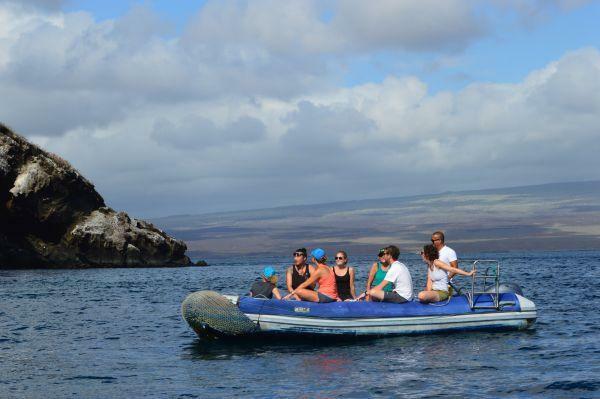 After the dive panga ride to the shoreline to observe the penguins, flightless cormorants and marine iguanas. Afternoon Cabo Marshall. The trip to Cabo Marshall will take a few hours. Travel along the coastline of Isabela and with an amazing view of the volcanoes that formed the island, Ecuador, Darwin and Wolf. Crossing the equator line south bound. 1 dive at Cabo Marshall the main attraction are the giant manta ray, it is up to 6m (18ft) wing span, swimming at low depth. Several small fish in large schools are to be seen here, too, such as barracudas. 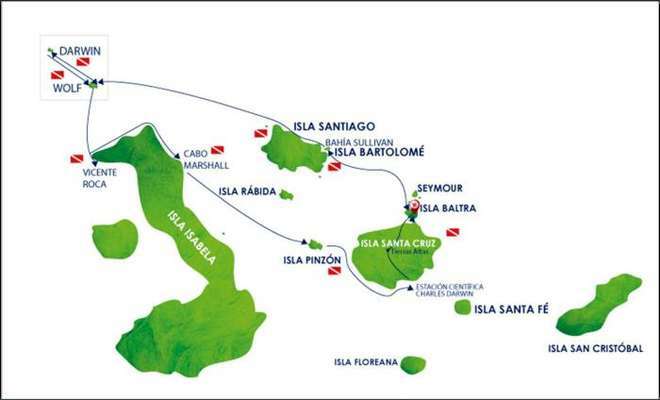 At this small island located in the center of the Archipelago, we will have our last dives of the trip. 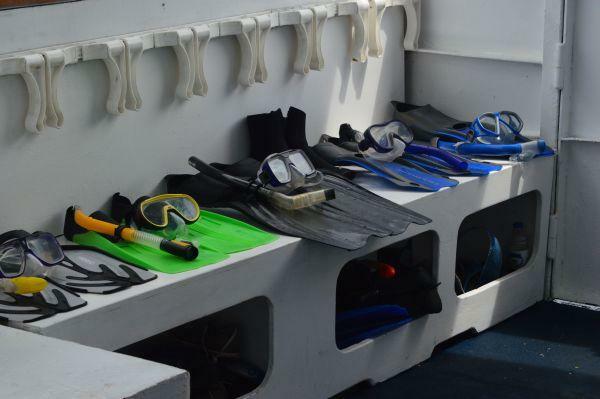 We will see the red lip batfish, giant manta rays, marbel rays, eagle rays and a large quantity of marine turtles. In the afternoon we travel towards Santa Cruz and visit the Charles Darwin Research Station with its interaction center and the giant tortoises that live here. They are bred to set them into the wilderness. ASTREA also offers to continue your adventure on board for a Naturalist cruise to explore the Islands on Land in an 8 day cruise. For those who leave the Enchanted Islands our guide will take you back to the airport in Baltra and check you in for your flight home, full of beautiful memories. Minimum 60 dives and drift dive experience are required for participation.The dives take place in 2 dive tenders with ouboarder engines to get as close to the dive sites as possible. Up to 19 dives are offered on a regular 8 day/7 night expeditions, it always depends on the local conditions and park regulations. 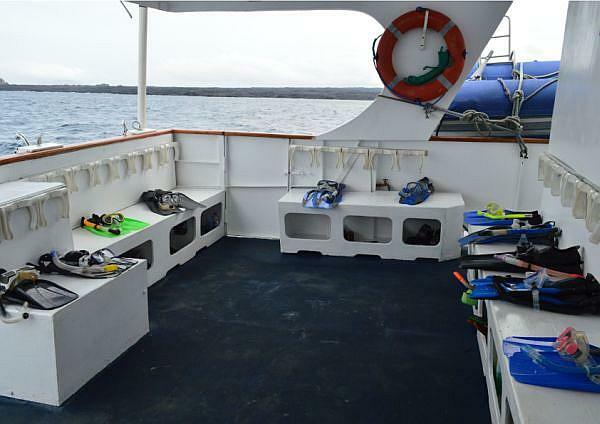 The dive deck is located on the main deck and is equipped with camera table, rinse tanks and storage compartments for each diver. Additionally it has a bathroom on the platform and two hot showers. Charging stations: We have 110 in cabins and in the saloon we can offer 220 under request.